The ImagePattern class fills a shape with an image pattern. The user may specify the anchor rectangle, which defines the position, width, and height of the image relative to the upper left corner of the shape. If the shape extends out of the anchor rectangle, the image is tiled. If the proportional variable is set to true (the default) then the anchor rectangle should be specified relative to the unit square (0.0->1.0) and will be stretched across the shape. If the proportional variable is set to false, then the anchor rectangle should be specified in the local coordinate system of the shape and the image will be stretched to fit the anchor rectangle. The anchor rectangle will not be stretched across the shape. The example below demonstrates the use of the proportional variable. The shapes on the top row use proportional coordinates (the default) to specify the anchor rectangle. The shapes on the bottom row use absolute coordinates. 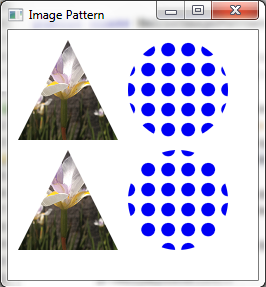 The flower image is stretched to fill the entire triangle shape, while the dot pattern image is tiled within the circle shape. Creates a new instance of ImagePattern from the specified image. Creates a new instance of ImagePattern. Gets the height of the anchor rectangle. Gets the image to be used as a paint. Gets the width of the anchor rectangle. Gets the x origin of the anchor rectangle. Gets the y origin of the anchor rectangle. Gets whether this Paint is completely opaque. Gets a boolean that indicates whether start and end locations are proportional or absolute. Creates a new instance of ImagePattern from the specified image. Default values are used for all other parameters. image - the image to be used as the paint. NullPointerException - if the image is null. IllegalArgumentException - if image is not done loading, that is if progress is < 1.
x - the x origin of the anchor rectangle. y - the y origin of the anchor rectangle. width - the width of the anchor rectangle. height - the height of the anchor rectangle. Image to be used as a paint. The x origin of the anchor rectangle. The y origin of the anchor rectangle. The width of the anchor rectangle. The height of the anchor rectangle. Gets a boolean that indicates whether start and end locations are proportional or absolute. If this flag is true, the two end points are defined in a coordinate space where coordinates in the range [0..1] are scaled to map onto the bounds of the shape that the pattern fills. If this flag is false, then the coordinates are specified in the local coordinate system of the node. boolean that is true if this paint is proportional. Gets whether this Paint is completely opaque. An opaque paint is one that has no alpha component in any of its colors. It may be possible for a Paint to be opaque and yet return false, if it cannot be easily determined whether the paint is actually opaque. For example, the ImagePattern may not be able to cheaply determine its opacity. true if the Paint is opaque, false if it is not opaque or if it cannot be determined.